This 40 Hour program provides field training in the basics of oil spill response techniques while incorporating the OSHA (29CFR1910.120) safety topics related to First Responders involved in an oil spill incident. Two thirds of the training will involve hands-on exercises in boat handling, and boom deployment and recovery. Day one of this course can be customized to provide OSHA 29CFR1910.120 Annual Refresher Training. The complexity of incident and event management, coupled with the growing need for multi-agency and multifunctional involvement on incidents, has increased the need for a single standard incident management system that can be used by all emergency response disciplines. The Incident Command System (ICS) resulted from the obvious need for a new approach to the problem of managing rapidly moving wildfires in the early 1970s. The ICS was developed by an interagency task force working in a cooperative local, state, and federal interagency effort called FIRESCOPE. In 1980, the ICS that was originally developed in California under the FIRESCOPE program made the transition into a national program called the National Interagency Incident Management System (NIIMS). Because of national interest in ICS and its growing use, a standard training curriculum was developed with the support and assistance of a multidisciplined and interagency steering group. All ICS courses offered are based on this nationally accepted curriculum. *This course is designed for executives, administrators and policy makers. It provides a basic understanding of the above listed subjects for persons who are not normally part of the on-scene ICS organization. The National Preparedness for Response Exercise Program (PREP) is a program established to satisfy the requirements of Section 4202(a) of the Oil Pollution Act of 1990 (OPA 90). PREP was developed to provide a mechanism for compliance with the exercise requirements of OPA 90, while being economically feasible for the government and industry to adopt and sustain. The ERTT Institute has established a program to facilitate and document the following internal requirements of PREP compliance. Qualified Individual (QI) notifications must occur quarterly, one of the notifications must occur after normal working hours of the QI. Annually, the Spill Management Team for a facility/vessel must participate in a tabletop exercise to utilize the facility response plan effectively. In a triennial cycle, one spill management team tabletop exercise shall involve a worst case discharge from the facility. Any facility owned equipment must be exercised at least semi-annually. During these exercises, facility personnel must show proficiency in deploying and operating the applicable equipment. Optional for Facilities. Vessels are required to perform this exercise once quarterly. Exercise the Emergency Procedures for the Vessel/Facility to mitigate or prevent any discharge or a substantial threat of a discharge of oil resulting from operational activities associated with oil transfers. This one-day seminar is designed to assist clients in meeting the Tabletop Exercise component of the National Preparedness for Response and Exercise Program (PREP). PREP was developed to establish a workable exercise program which meets the intent of section 4202(a) of the Oil Pollution Act of 1990 (OPA 90). PREP was developed to provide a mechanism for compliance with the exercise requirements, while being economically feasible for the government and oil industry to adopt and sustain. PREP is a voluntary program, however, industries which satisfy the PREP guidelines are considered to be in compliance with the exercise requirements of OPA90. An integral portion of PREP is the requirement to conduct an annual Spill Management Team Tabletop Exercise (SMTTX). All response plan holders must identify a spill management team in the response plan. The annual SMTTX must utilize the response plan in the exercise to ensure the Spill Management Team (SMT) is familiar with the plan and is able to use it effectively to conduct a spill response. At least one SMTTX in a triennial cycle shall involve a worst case discharge scenario. The ERTT, with input from clients and regulatory authorities, has developed a seminar which not only satisfies this annual requirement, but provides members of the spill management team with “real-world” experiences in situations encountered during an actual response. The process begins with an extensive review of the clients’ Facility or Vessel Response Plan by an ERTT team of highly qualified professionals. Upon completion of this review, the team develops a scenario and generates tasks for the SMT to discuss and resolve. The exercise is facilitated by the same ERTT team which reviewed the plan and is available to answer questions or resolve conflicts within the exercise. Utilizing ERTT’s experiences in past responses, the team is able to inject challenging problems into the exercise. At the completion of the exercise the SMT comes away with a firm grasp of its Vessel or Facility Response Plan, identifying strengths and weaknesses in the plan and developing a keen sense for challenges which can present themselves during an actual response. Contingency planning documents have become a staple of the oil spill prevention regulations, whether it is a state or a federal regulation the process of initially writing and then maintaining these plans can take valuable time and focus away from core responsibilities. The ERTT Institute stands poised to provide this service to those who transport, store, or handle products that require contingency planning documents. The process of contingency plan writing takes into account the particulars of the facility / vessel that requires the plan, (i.e. tankage, shell capacity, notifications, site maps / vessel drawings). This information with additional specifics is then framed into the contingency plan. The review process is done annually by the planholder and periodically depending on the regulation that requires the plan. The ERTT Institute can write and maintain the respective plan in order to keep the facility / vessel in compliance with all federal and state regulations pertaining to Oil and Hazardous Substances in an emergency response. The benefit to having the ERTT Institute write and review a contingency plan for a particular facility / vessel would be the integrated training that we provide in order to implement the contingency plan. This training activates the plan and the participants maximizing the effectiveness for all of the responders to a release of an Oil or Hazardous Substance. This course was designed to heighten personnel awareness of the environment with respect to their work, their home and their recreational activities. · Identifying the consequences of environmental hazards as they relate to legal, social and environmental aspects as well as personal health and safety. · Identifying company procedures that address employee responsibilities during emergencies leading to environmental hazards. · Identifying potential environmental and personal safety and health hazards that exist in the work area. · Identifying systems in the work place with the highest incident rates for environmental impact. · A minimum of three site visits with a dedicated subject matter expert. · A kick-off meeting with the Site manager (or equivalent), Environmental affairs manager (or equivalent), Maintenance manager (or equivalent) and the Training manager (or equivalent). This course has been attended and approved by a number of personnel from the New York State Department of Environmental Conservation as well as a federal monitor. This training course meets all current OSHA guidelines for non-site specific training required for personnel working on CERCLA and RCRA sites and all personnel who require training under 29CFR1910.120. The curriculum includes a balance of classroom and hands-on filed exercises. This class meets all current OSHA guidelines required for required for emergency response personnel who require training under 29CFR1910.120. The curriculum includes a balance of classroom and hands-on field exercises. 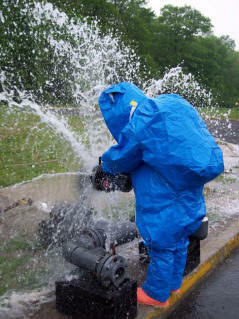 This course has been developed to comply with 29 CFR 1910.120 (q) for emergency response personnel who require training under the HAZWOPER standard. The curriculum includes a balance of classroom and hands-on training techniques. The complexity of incident and event management, coupled with the growing need for multi-agency and multifunctional involvement on incidents, has increased the need for a single standard incident management system that can be used by all emergency response disciplines. The On-Scene Incident Commander is an integral part of the Incident Management Structure. Because of national interest in ICS and its growing use, a standard training curriculum was developed with the support and assistance of a multidiscipline and interagency steering group. All Incident Command System courses offered are based on this nationally accepted curriculum. This training course is designed to teach personnel how to evaluate potential workplace hazards and the appropriate protective measures that must be taken in accordance with 29CFR1910.1200. A one day seminar designed to fulfill the non-site specific offsite HAZWOPER training requirements for supervisory personnel working on CERCLA sites, major corrective actions at RCRA sites, and for all other management level personnel requiring training under 29CFR1910.120. A one-day HAZWOPER refresher seminar designed for those with previous 24 and 40-HOUR OSHA/RCRA training under 29CFR1910.120. This training can be conducted on an exclusive basis or in our regularly scheduled classes. This training course meets all current OSHA guidelines required for entry of personnel into permit-required confined spaces in accordance with 29CFR1910.146. This seminar covers all applicable DOT regulations and training requirements for shippers, carriers and transporters of hazardous materials. The course length is dependent upon individual prerequisite training. The elements that are covered in this course are General Awareness, Safety Training, and Function Specific training for shippers, carriers and transporters of hazardous materials. This training course meets all of the requirements published by OSHA for the ultimate prevention of exposure to blood, bodily fluids, or any other potentially infectious secretion that could lead to disease or death. The purpose of the Emergency Response to a Criminal/Terrorist Incident training is to increase local emergency responders’ ability to preserve evidence while performing rescue and fire suppression activities, foster a cooperative working relationship when working together in responding to criminal incidents, and prepare for incidents when Federal responders are involved. l Recognize when incident sites may also be crime scenes. l Describe types and identify potential targets of criminal activities. l Recognize potential hazards at crime scenes. l Perform safe operations at criminal incident sites including rescuing and treating victims and preserving property. l Stabilize the crime scene and maximize evidence preservation. l List appropriate actions and actions to avoid at a criminal incident site. l Describe the needs, roles, and responsibilities of law enforcement and non-law enforcement responders at a criminal incident site. l Explain when and why Federal agencies get involved and how to interact with them. The primary target audience for this course is local emergency responders, including firefighters, emergency medical service providers, public works officials, law enforcement officers, and other emergency management personnel. It is critical to have a mix of law enforcement and non-law enforcement responders participating in the course. This training course meets all current OSHA guidelines required for entry of personnel into permit-required confined spaces in accordance with 29CFR1910.146. This course is also designed to prepare the student for rescue operations. It takes a in-depth look at preplanning of operations and detailed equipment use. This course covers the revised 1998 standard for rescue operation and how it’s not just the local Fire Departments problem anymore and how liability falls solely on the employer . This service is designed to properly select the specific respirator for an individual based on their job description. It will also insure that the protection selected is properly fitted to the individual. The necessary information concerning Respiratory Protection will be communicated to each individual during the fit test. This service will be provided in accordance with 29 CFR 1910.134. This course is designed to instruct personnel on how to protect themselves during maintenance or operations of machines and equipment in which the unexpected energization or start up of the machines or equipment, or release of stored energy could cause injury to employees. This course will be conducted in accordance with 29 CFR 1910.147. This seminar is designed to provide hands – on training that ensures each employee has a full understanding and mastery of the skills necessary to operate a forklift safely as per OSHA’s Powered Industrial Truck Standard 29 CFR 1910.178. The course length is dependent upon individual prerequisite training. The elements that are covered in this course are Equipment Operation, Safety Training, and Function Specific training for Forklift Operators. Incorporated into this training is a hands – on portion. Utilizing site specific criteria, a practice maze is created on site and participants are drilled on following operational & directional commands. "Environmental Health & Safety Specialist"
Send mail to webmaster@ertt.org with questions or comments about this web site. TRANSCAER® (Transportation Community Awareness and Emergency Response) is a voluntary national outreach effort that focuses on assisting communities prepare for and respond to a possible hazardous material transportation incident.